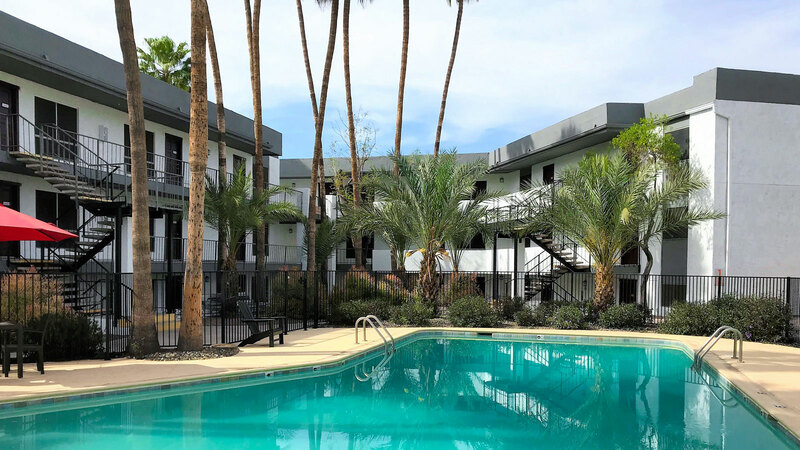 Phoenix, AZ – August 15, 2018 – ABI Multifamily, the Western US’s leading multifamily brokerage and advisory services firm, is pleased to announce the $19,000,000 / $113,772 Per Unit sale of Cabana on Mill Apartments located in Tempe, Arizona. Built in 1972 of block construction and renovated between 2012-2018, Cabana on Mill is a garden-style apartment community that features 167 units in 24, two-story buildings. The property rests on approximately 7.38 -acres with a unit mix that consists of (57) one bed and (110) two bed units with an average size of 780 SF. The fully gated property features two swimming pools, bike storage, laundry facilities, a ping pong table, barbeque grills, pet areas, and a business center. Future further exterior renovations will include new pool furniture, touch-up painting, updating the fitness center, refreshing the landscaping, installing a new monument sign and unit placards, installing solar screens to block out sun and keep units cooler, and installing new LED lighting throughout the Property. All units currently include fully equipped kitchens and private patios or balconies. "The selling entity purchased the property back in 2012 and immediately began improving both the aesthetic and overall operations of the property," states Alon Shnitzer, Senior Managing Partner, who represented the selling entity in the transaction. "This is a beautiful project in a dynamic South Tempe location. In fact, the South Tempe submarket has attracted substantial institutional investor interest over the past 18 months most notably Rockwood Capital’s $76M purchase of Metropointe Apartments and TruAmerica’s $75M purchase of the Galleria Palms Apartments." Eddie Chang, Partner, who along with Ryan Smith, Vice President, represented the buying entity states, "this is the buyer’s, Tides Equities, 14th transaction since 2016 as they continue to expand their portfolio of value-add properties in highly desirable neighborhoods. The property is near the high employment corridors of both North Tempe and a short drive to Chandler’s Price Corridor which combined have witnessed nearly 22,000 new jobs over the last several years. They plan to further expand on the improvements the seller made over the years ensuring a premier community for its residents." The buying entity is controlled by California-based Tides Equities. Tides Equities is a leading Commercial Real Estate Investment Company focused on investments throughout the Western United States. They specialize in well located, Class-B and Core Plus multifamily real estate with high value-add upside. Tides Equities brings institutional grade acquisitions acumen and operational efficiency to the traditionally non-institutional realm of real estate. The multifamily brokerage team of Eddie Chang, Ryan Smith, Alon Shnitzer, John Kobierowski, Rue Bax and Doug Lazovick represented both the buyer and seller in this transaction.